The announced Immortality 4 Fight night on March 26th, 2011 has been postponed until June 2011. Reportedly, Invincible Promotions have chosen to move their Immortality 4’s date to be able to bring their audience a bigger and better fight card with a presumably suitable larger scale main event. More information and a confirmed date will be posted soon by the promoters. Instead, taking place on March 26th, 2011 will be the Title Wave event. 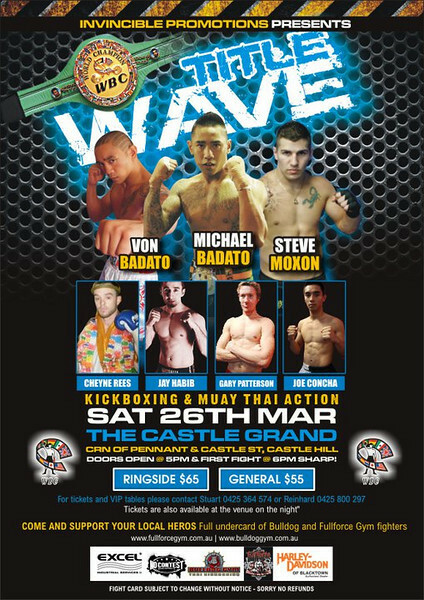 Though it is soon to say what match ups are already made, what can be expected is that one or more of the faces focused on in the poster art which includes Von Badato, Michael Badato, and Steve Moxon will be the main event fighter. Of the possible main event participants the competing weight of 67 kg with Michael Badato, 75 kg with Von Badato, or 72.5 kg with Steve Moxon is ripe with possibilities. Moxon was last seen in action against WBC Muay Thai Mexico champion Luis Bio who he defeated by unanimous decision in December 18th, 2010 at the WCK and Tony Chen promoted Wu Lin Feng rules (essentially sanda rules) and Muay Thai show held over the course of 2 days in China.